At Expediant Environmental Solutions, LLC, we specialize in repairing and upgrading crawl spaces of all shapes and sizes. We install vapor barrier systems, crawl space insulation, drainage, sump pumps, structural supports, and much more! Since we opened our doors to business, our experts have upgraded thousands of crawl spaces across New York, including in Poughkeepsie, Millbrook and the surrounding areas. To schedule a free crawl space repair quote, contact us by phone or e-mail today! We can provide you with a wide variety of patented, award-winning products that are made specifically for the crawl space environment. Our experts can upgrade your home's energy efficiency, as well as provide you with professional waterproofing, moisture control, and structural repair services. Expediant Environmental Solutions, LLC are the local experts for crawl space insulation and air sealing. If your crawl space is also in need of structural supports, our SmartJack® system is compatible with any of these combinations. We can also provide you with our self-draining ENERGY STAR-Rated SaniDry™ Sedona Dehumidifier, or our Turtl Crawl Space Access System -- giving you easy in and out access to your crawl space. At Expediant Environmental Solutions, LLC, our experts work with you to create a warrantied system that meets all the goals you've set out to accomplish. Before we leave, we'll provide you with a free quote for crawl space repair that lays out your system and shows the cost in black and white. 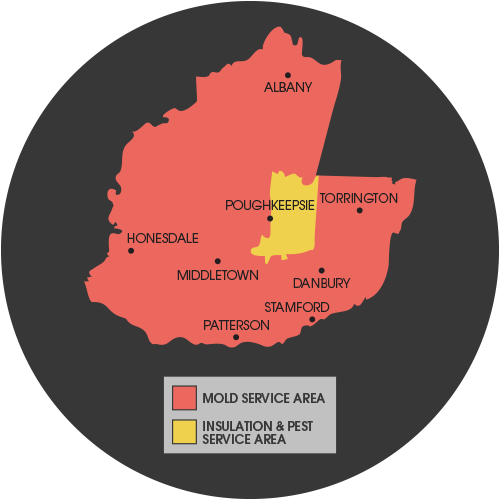 We proudly serve New York, including Poughkeepsie, Millbrook, Billings, and many surrounding areas. Contact us today to schedule your appointment!